Yash Raj Films took to Twitter to unveil the first official poster of Maneesh Sharma's upcoming thriller Fan. In the film, Shah Rukh Khan will essay the character of a fan as well as a superstar and the first poster gives an idea about the conflict between the two characters. The combination of red and blue, suggesting ice vs fire is definitely attention grabbing. 'SORRY' written right in between the fan and superstar seems to have some significance in the story. "Duniya ke sabse bade superstar ka sabse bada FAN will cross paths with his idol soon. Here is the official #FANPoster" reads official tweet by YRF. The theatrical trailer of the much-anticipated film is set to be launched at a mega event in Mumbai today. Around 4,000 Shah Rukh Khan fans are expected to attend the event, which will take place at Yash Raj Studios in Andheri. 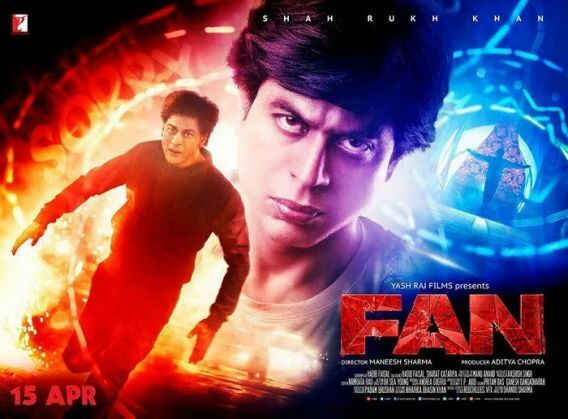 Fan releases on 15 April 2016.